Osteomyelitis - how long, body, last, contagious, What Is Osteomyelitis? Osteomyelitis (ah-stee-o-my-uh-LYE-tis) is a bone infection that is usually caused by bacteria. It can involve any bone in the body, but it most commonly affects the long bones of the arms and legs. * intestines are the muscular tubes that food passes through during digestion after it exits the stomach. Osteomyelitis usually is caused by infection with bacteria. Staphylococcus aureus (stah-fih-lo-KAH-kus ARE-ree-us), streptococcal (strep-tuh-KAH-kul) species of bacteria, and Pseudomonas aeruginosa (su-doe-MO-nas air-ew-jih-NO-suh) are the major organisms associated with osteomyelitis. These bacterial intruders can travel from other parts of the body, such as the ear, throat, or intestines * , through the bloodstream and to a bone, where they can start an infection. Bones that have been weakened or damaged, such as one that has been injured recently, are more susceptible to bacterial invasion. When there is trauma * to the bone, like a puncture wound from stepping on a nail, bacteria can infect the bone directly. Rarely, fungi may cause osteomyelitis, and the spread of tuberculosis (too-ber-kyoo-LO-sis), a contagious disease that typically affects the lungs, through the body also can lead to bone infection, usually in the spine. In children, osteomyelitis occurs most often in the long bones of the leg, such as the femur (FEE-mur) and tibia (TIH-be-uh). Adults tend to have the infection in the hipbones and vertebrae * , where it may occur following surgery on a bone or from an infection that has spread from the skin. People with diabetes * can have osteomyelitis in the foot bones from ulcerations * on their feet. Osteomyelitis that evolves rapidly is called acute * osteomyelitis. If a bone infection persists because it is not treated or it does not respond to treatment, it is known as chronic * osteomyelitis. Over time, the infection may interfere with the blood supply to the bone, causing the bone tissue to die. * trauma is severe injury to the body. * vertebrae (VER-tuh-bray) are the bones that form a column surrounding the spinal cord; there are 39 vertebrae in the spine. * diabetes (dye-uh-BEE-teez) is a condition in which the body's pancreas does not produce enough insulin or the body cannot use the insulin it makes effectively, resulting in increased levels of sugar in the blood. This can lead to increased urination, dehydration, weight loss, weakness, and a number of other symptoms and complications related to chemical imbalances within the body. * ulcerations are open sores on the skin or tissue lining a body part. Some cases of osteomyelitis last for years, even a lifetime. Joshua Lawrence Chamberlain rose to the rank of general in the U.S. Civil War and was a hero in the Battle of Gettysburg. General Ulysses S. Grant selected Chamberlain to receive the official surrender of the Confederate Army's weapons at Appomatox, Virginia, in 1865. He later served as governor of Maine and president of Bowdoin College. Before he reached that lofty standing, Confederate soldiers had shot him in the groin in a battle at Petersburg, Virginia, in 1864. The ball pierced both hipbones, but despite the crude battlefield surgery of the time he survived his injury. His wound never healed completely, though, and Chamberlain lived another 50 years with chronic osteomyelitis. He died in 1914, at the age of 85, from complications of that long-lasting wound. Chronic osteomyelitis occurs in about 2 in 10,000 adults. Children have the acute form of the disease more often than adults do, at a rate of about 1 in 5,000. People who have diabetes, who have had a traumatic injury recently, or who use intravenous * drugs are at greatest risk for chronic infection. Special bone scans are used to diagnose osteomyelitis. The affected areas of bone "light up" on these scans. Bone infections are not contagious. However, some types of bacteria that cause the infections that can progress to osteomyelitis are passed from person to person. The first sign of acute infection may be a fever that begins suddenly. The area over the infected bone may become warm, red, and swollen, and the joints next to the bone may swell as well. As the infection progresses, it can cause pain in the affected bone and may limit the person's movement in that area. Some people with osteomyelitis feel irritable, nauseated, and generally sick. Patients with long-term bone infection may experience drainage of pus * through the skin covering the affected bone. * pus Is a thick, creamy fluid, usually yellow or greenish in color, that forms at the site of an infection. Pus contains infection-fighting white blood cells and other substances. * magnetic resonance imaging (MRI) uses magnetic waves, instead of X rays, to scan the body and produce detailed pictures of the body's structures. * computerized tomography (kom-PYOO-ter-ized toe-MAH-gruh-fee) or CT, also called computerized axial tomography (CAT), is a technique in which a machine takes many X rays of the body to create a three-dimensional picture. To help make the diagnosis, a doctor may order an X ray of the suspect area to look for signs of bone inflammation or damage, but changes in the bone may not show up for weeks after the infection begins. Magnetic resonance imaging * (MRI) or a computerized tomography * (CT) scan may show changes that reflect osteomyelitis sooner than X rays will. Radionuclide scans * may help pinpoint the location of the infection early in the course of the disease. Blood cultures * or, less commonly, a bone biopsy * may identify the infectious agent. What Is the Treatment for Osteomyelitis? Patients with osteomyelitis usually need to be hospitalized. They typically receive antibiotics for 4 to 6 weeks to combat the infection. At first, the medication is given intravenously, but patients may be switched to oral (by mouth) medicine as the treatment continues and their condition improves. In more serious and chronic cases, patients may need an operation to remove bits of bone that have died. To help new bone grow, surgeons may perform a bone graft, in which bone from another part of the body is placed in the spot where dead bone has been removed; doctors may use packing material to fill in the open area temporarily. Patients with osteomyelitis often need several weeks or months of treatment before the infection clears up. Acute cases may resolve after as little as 1 month of antibiotic therapy, but chronic cases can linger much longer. In children, osteomyelitis can damage growing bones permanently, especially if it is not promptly and adequately treated. Infection may spread to the blood, overlying skin, or nearby joints. Bones may be weakened and break more easily. Movement of nearby joints or limbs may become limited. Occasionally in chronic cases, severe infection or damage to the bone may result in the need to amputate, or remove, part or all of a limb. Quick, thorough treatment of any infection, particularly those from deep wounds, can lower the risk of osteomyelitis. It is recommended that patients who are more susceptible to osteomyelitis, such as those with diabetes, contact a doctor promptly if they notice signs of infection. * radionuclide (ray-dee-o-NUklide) scans are tests that begin by giving a patient a small amount of a radioactive substance. 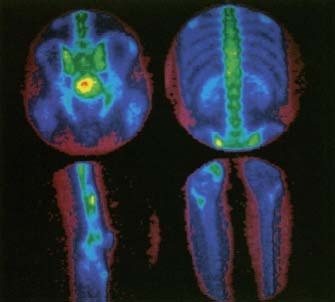 The radioactive substance shows up on a scan, producing a view of the structure or function of the part of the body being studied. * cultures (KUL-churz) are tests in which a sample of fluid or tissue from the body is placed in a dish containing material that supports the growth of certain organisms. Typically, within days the organisms will grow and can be identified. KidsHealth.org . KidsHealth is a website created by the medical experts of the Nemours Foundation and is devoted to issues of children's health. It contains articles on a variety of health topics, including osteomyelitis.